SEOUL, Dec 19, 2011 (AFP) - The young man tipped to be North Korea's next leader and propel the Kim dynasty into a third generation is even more of an enigma than his mercurial father Kim Jong-Il, who has died at the age of 69.North Korean state media on Monday urged people to follow Kim's youngest son and heir apparent Kim Jong-Un, aged in his late 20s, after announcing that his father had died on Saturday, plunging the country into confusion. Kim Jong-Un's life is shrouded in mystery, but in recent years he has been pushed to the forefront as his father apparently speeded up plans for a second dynastic succession after suffering a stroke in August 2008. In September 2010 the son was made a four-star general and given senior ruling party posts, despite his lack of any military experience. It was only then that state media published his first-ever adult photograph. Since his elevation, Kim Jong-Un has been constantly at his father's side, and said to be actively involved in state affairs. In recent months, state media began referring to him as "general", after having previously only used his official title -- vice-chairman of the central military commission of the Workers' Party of Korea. "The latest move indicates Kim Jong-Un is being put forward formally as a powerful leader like his father," Sejong Institute analyst Cheong Seong-Chang, a specialist in the succession issue, said in October. "Such a title has been used internally but North Korea now appears to be boosting the image of Jong-Un as military leader," he added. Little is known about the succession. South Korea's top official on cross-border affairs said last month that there would be challenges in transferring power to the son. Kim Jong-Il's only sister Kim Kyong-Hui and her husband Jang Song-Thaek, the country's unofficial number-two leader, are expected to act as his guardian and throw their political weight behind him, analysts say. In a memoir, Kenji Fujimoto, a former Japanese sushi chef for Kim Jong-Il, described the Swiss-educated Jong-Un as a "chip off the old block, a spitting image of his father in terms of face, body shape and personality"
Despite the dearth of information, Jong-Un has made headlines since his name was floated by South Korean media in early 2009 as the figure being groomed to succeed his father. 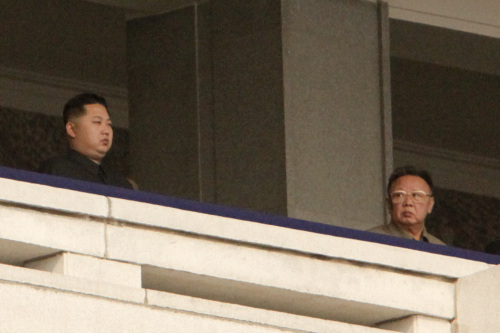 "Jong-Un is known to have the potential to become a strong, ruthless leader. He has a take-charge personality," Sejong Institute's Cheong has told AFP. South Korea's spy chief Won Sei-Hoon said last year that Kim Jong-Il's poor health had driven him to speed up preparations for the transfer of power, with the son taking a bigger role in policy-making and frequently accompanying his father on trips. Some analysts had seen second son Kim Jong-Chul as favourite to take over. But Fujimoto said in his memoir that Kim thought of Jong-Chul as too feminine and unfit for leadership. Eldest son Jong-Nam apparently spoiled his prospects after being deported from Japan in 2001 for trying to enter with a forged passport while attempting a visit to Tokyo Disneyland. Jong-Un was born to the leader's third wife, Japan-born ethnic Korean dancer Ko Yong-Hi, who is believed to have died of breast cancer in 2004. He is believed to have studied at international school in Switzerland under a false name. Back in Pyongyang, South Korea's Yonhap news agency has reported, he attended the Kim Il-Sung Military University and graduated in 2007. 북한에서 절대권력을 휘두르던 김정일 국방위원장이 사망함에 따라 전 세계의 시선이 후계자 김정은이 권력을 틀어쥘 수 있을 것인 지에 쏠리고 있다. 일단 올해 29세(북한측 주장)인 김정은은 부친이 보여줬던 것과 마찬가지로 `3년상(喪)'이라는 과정을 거치면서 김정일 위원장에 대한 충성심을 내부에 과시함으 로써 권력의 공고화를 꾀할 것으로 보인다. 그러나 김정은의 의도대로 권력의 기반을 다질 수 있을지는 불투명하다. 우선 2009년 후계자로 내정되고 2010년 당 대표자회를 통해 당 중앙군사위 부위 원장에 올랐지만 김정은이 권력 승계 준비가 전혀 안 돼 있다는 지적이 나온다. 북한측 주장에 따르면 김정은 1982년생으로 올해 29세에 불과할 뿐 아니라 당 중앙군사위 부위원장으로 김정일의 후광 속에서만 활동했지 단독으로 정책을 결정하 고 국정을 운영해본 경험이 거의 없다는 것이다. 이에 따라 3년상의 과정에서 김정은은 후견인 격인 장성택 국방위 부위원장의 조력을 받아야만 할 것으로 보인다. 그러나 김정은을 후계자로 추천한 인물로 알려진 장성택은 행정부장으로 공안업 무를 책임질 뿐 아니라 국방위 부위원장으로 국방정책에도 간여하고 있고 나선 및 황금평 특구 개발을 담당하는 북·중공동지도위원회의 북측 위원장으로 외자유치 사 업에도 깊숙이 개입하고 있다. 특히 2010년 당 대표자회에서 최룡해 당 비서, 리영수 당 부장, 문경덕 평양시 당 책임비서, 지재룡 주중 대사 등 장성택의 최측근으로 분류되는 인물들이 대거 중 앙정치 무대에 진입했다. 힘이 커질대로 커진 장성택이 손에 쥔 권력을 김정은에게 순순히 넘겨줄지는 미 지수라는 관측이 나오는 이유다. 일단 김정일이라는 거대한 힘의 공백이 생긴 가운데 김정은에게는 장성택 부위 원장이 든든한 백이 될 수도 있지만 권좌에 오르는 과정에서 최대의 라이벌이 될 수 도 있어 보인다. 일각에서는 북한의 군부가 김정은을 견제하고 새로운 권력을 창출하려고 할 수 있다는 관측도 나온다. 김정일 위원장의 생전에 김정은에게 첫 공직으로 당 중앙군사위 부위원장을 준 것도 그만큼 북한에서 군부의 힘이 절대적임을 보여주는 것이다. 김정은이 후계자로 공식 등장한 이후 국가안전보위부와 인민보안부, 군 정찰총 국 등 공안기관을 장악하고 이들로부터 충성을 다짐받았다고는 하지만 군부가 다른 마음을 먹을 가능성을 배제할 수 없다. 권력욕이 큰 것으로 알려지고 있는 김영춘 인민무력부장 등이 새로운 권력을 꿈 꿀 가능성도 있으며 일부에서는 장성택 부위원장이 군부와 손을 잡고 새로운 지도자 를 옹립할 수 있다는 예상도 나온다. 이렇게 된다면 중국에 체류 중인 것으로 알려진 김정은의 이복형 김정남이 새로 운 지도자로 내세워질 수도 있다는 시나리오도 제기된다. 다양한 예상에도 역시 가장 가능성이 높은 것은 김정은이 김정일의 뒤를 이어 권좌에 올라 김일성-김정일-김정은으로 이어지는 근대 사상 초유의 3대세습을 완성 하는 것이다. 이 경우 일단 김정은은 권력장악을 위해 주요 엘리트들의 마음을 잡기 위해 이 른바 `비밀파티' 등 다양한 작업에 나설 것으로 예상된다. 김정일 위원장도 후계자 시절부터 측근들을 결집해 권력을 강화하는 수단으로 비밀파티를 애용한 것으로 전해졌다. 실제로 김정은은 후계자로 내정된 이후 김 위원장의 측근 비밀파티에 빠짐없이 참석하고 있으며, 이와는 별도로 김 위원장의 허락 하에 군부와 노동당 실세들을 불 러 모아 자주 비밀파티를 여는 것으로 전해졌다. 북한문제 전문가는 19일 "김정일 위원장은 자신의 독자시대를 열기까지 20년이 넘는 세월동안 권력투쟁과 업적쌓기를 통해 권력을 만들어 갔지만, 김정은은 조기에 홀로서기를 해야하는 입장"이라며 "대외적 요소보다는 오히려 내부의 권력투쟁이 김 정은에게 큰 위협이 될 수 있다"고 내다봤다.